Wow! Over 2,700 RealTracks in the UltraPAK, UltraPAK+, and Audiophile Edition.! Over 2,900 hours of studio musicians recordings! PG Music offers 328 RealTracks Sets, with over 2,700 RealTracks for Jazz, Country, Rock, Pop, Metal, Blues, Bluegrass and more! 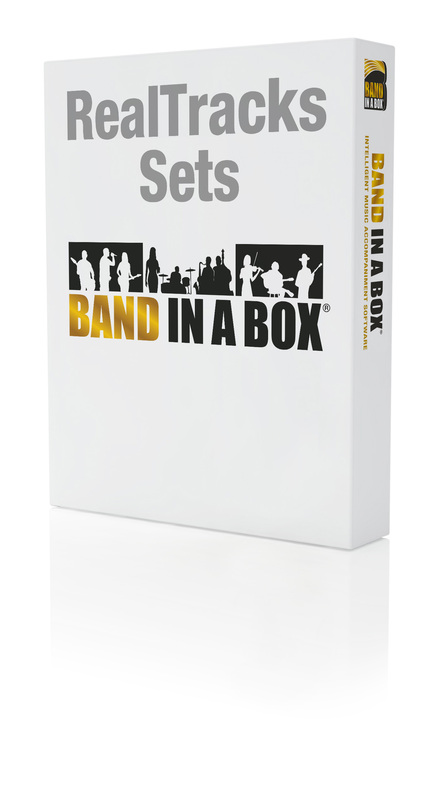 We've made it easy to get RealTracks Sets - ALL of the RealTracks Sets are included in the UltraPAK and Audiophile editions of Band-in-a-Box®. New RealTracks Sets 301-328 are included in the PlusPAK. Note: This RealTracks Set requires Band-in-a-Box® 2019 for Windows or higher. RealTracks Set 320 : Chicken Pickin' with Johnny Hiland! RealTracks Set 313 : More Klezmer! RealTracks Set 306 : Tango and More! Note: This RealTracks Set requires Band-in-a-Box® 2018 for Windows or higher. Looking for a faster tempo Americana vibe with a throwback feel? RealTracks Set 280: Americana - Gritty Blues & Rockabilly Swing is just what you need! This set features Nashville session musicians Byron House, Brent Mason, Colin Linden, and Mike Rojas playing acoustic bass, electric guitar, piano, and drums for two complete bands! Want to follow along with the pros? No problem - with the RealCharts notation and guitar tabs built into the tracks, it’s never been easier! One of our most frequent requests has been authentic “Americana” styles, and with this new set, we’ve provided! With RealTrack Set 279: Americana: Slow Groovin' 12-8 & 16ths you’ll find bass, guitar, and fiddle parts played by authentic Americana artists – straight from the heart of Nashville! With this RealTrack Set, you’ll be able to create tracks for your songs played by the incomparable Byron House, Brent Mason, Colin Linden, Andy Leftwich, and Bryan Owings! With built-in RealCharts, you’ll be able to follow along with notation and guitar tab – an invaluable learning tool for any musician! Note: This RealTracks Set requires Band-in-a-Box® 2017 for Windows or higher.